Whether you are composting indoors or out, irritating little fruit flies sometimes invade your house. 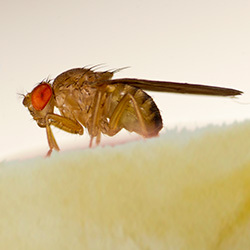 Exposing organic matter to the air attracts drosophila melanogaster. Even fresh fruit on the countertop or in a fruit bowl brings them on. How do fruit flies get into the house? How can you prevent them? What can you do to get rid of them? Uncle Jim’s Worm Farm has been dealing with this question for over 40 years. Most households choose to compost kitchen scraps outdoors. They collect wasted organic material a pail or container with a lid. After some scraps have accumulated, they dump the scraps into a larger outdoor composter. This could be a pile, a rough structure made from scrap materials, a tote(link), a composter purchased from a store, or a composter bought online. 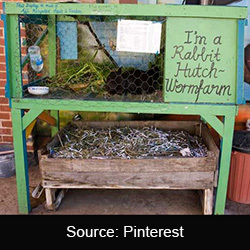 “Vermicomposting” means adding composting worms to the composter. Typically, they are Red Composting Worm Mix or sometimes Super Reds (European Night Crawlers). Worms speed up the composting process and keep it cooler. While regular composting has a strong odor, vermicomposting smells “earthy.” Worm castings are more nourishing than regular compost. The resulting fertilizer is teaming with soil-friendly bacteria. 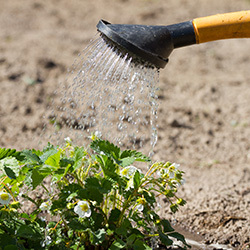 This fertilizer helps plants grow strong. Vermicomposting requires a little more care than regular composting. The worms need bedding to start. They don’t like certain foods: acidic, meat, dairy, etc. However, farmers and gardeners swear by the quality of the resulting fertilizer. You can move vermicomposting indoors. Some apartment dwellers prefer this. Some find it more convenient. 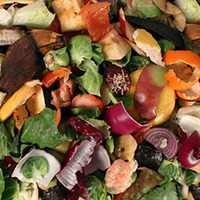 Regardless of the type of composting, food scraps will be hanging around the house. And fruit flies might take advantage. It is possible that a fertile fruit fly comes in through a door or window. More likely, their eggs, larvae, and pupae hitch a ride inside some fresh produce. Females lay their eggs just under the surface of fruits and vegetables. The eggs hatch and soon, you have a swarm of fruit flies. They generally hang around food sources, but they could congregate near a sink or elsewhere. Fruit flies will not harm you. They cannot bite or sting. However, where there are flies, there are maggots. Also, flies are unsanitary. Best to get rid of them quickly. You will never be able to swat them all with a fly swatter. They are too small and wily. Instead, use a vacuum cleaner, hand vac, or shop vac. Avoid sucking up other material such as curtains or compost. The force of getting sucked into the vacuum will kill them. Vacuuming will take care of the visible fruit flies. However, some fruit flies are still around. Also, existing eggs and maggots will inevitably hatch. You need to outsmart them and set a trap. 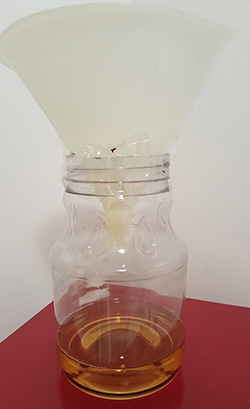 A fruit fly trap takes just 5 minutes to make. This trap uses the fruit fly’s natural attributes against them. They are attracted to bait: apple cider vinegar. But your dish soap will break the surface tension, causing them to drown. Meanwhile, they will have a hard time escaping because they cannot fly straight up very well. Build one, and you will see that it works! You will need apple cider vinegar, a jar, dishwashing liquid, a funnel (or paper to fashion a funnel) and tape. 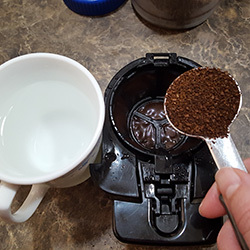 Place the funnel in the top of the jar, with the tip pointing down. Make sure the tip of the funnel does not touch the vinegar. Now move one or more of the fruit fly traps to wherever the flies are hanging out. Do not place a trap directly IN a composter or it might spill. Instead, place the fruit fly trap nearby. In a few days, most of the adult fruit flies will have disappeared. In a few weeks, your problem should be over. New flies might hatch, but they should be lured into the trap. Fruit flies mature in about 1 to 2 weeks. After a month or so, you can take the trap away if the fly problem has stopped. Your trap might accumulate quite a few flies. You can tip it into the trash and add the liquids again a new one if this bothers you. Uncle Jim’s carries fruit fly traps in case you do not want to make your own. Keeping produce refrigerated cuts down on fruit fly problems. They don’t do well at colder temperatures. Place fruit in a fruit bowl, and you will eventually get them. Organic material thrown into the trash invites fruit flies to hatch. Collecting kitchen scraps on the countertop in a container is a recipe for fruit flies. Room temperature storage of organic material invites anaerobic bacteria to grow, leading to horrible odors. Kitchen scraps should be kept in a container in the refrigerator or freezer. Once they have accumulated a bit, take them out to the composter. If your composter is indoors, cut the scraps up small. Bury them in the bedding. The worms will break down small scraps faster than large chunks of scraps. Fruit flies will have a hard time finding scraps that have been buried. Live and let live! But do not let fruit flies set up camp in your house. By taking a few precautions, you can tame the lowly drosophila melanogaster. Keep your home cleaner, protect your fresh produce, and continue your composting program. Uncle Jim’s Worm Farm specializes in composting worms. We also offer indoor composters, composting pails, and composting advice. Join us on social media.